We continue to guarantee fish in the 2019 season. Experience some of the year’s best fishing. 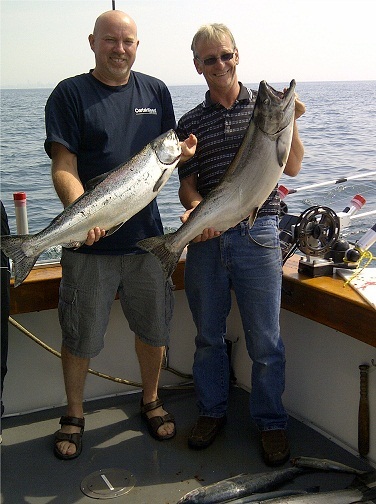 Our Lake Ontario fishing charter operates out of the beautiful Port Credit Harbour Marina. Call us now to secure your booking for the dates you want. 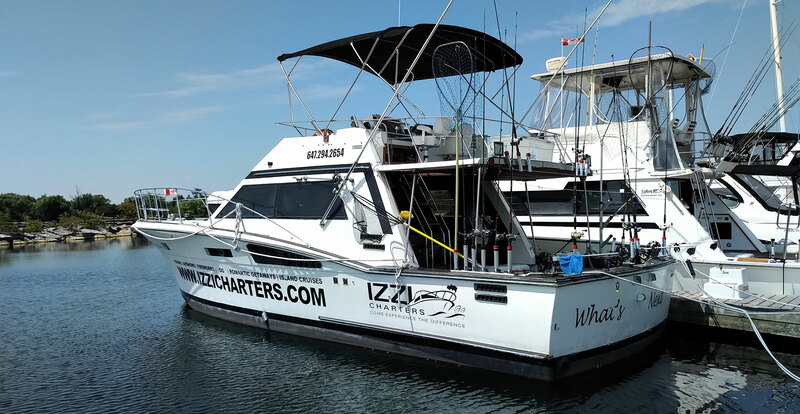 For Toronto salmon fishing at its best – serving Port Credit, Mississauga, Toronto and Southern Ontario – Izzi Charters offers daily off-shore salmon fishing charters on Lake Ontario for trophy salmon and rainbow trout. Our tournament ready 50′ yacht is fully equipped for top Lake Ontario salmon fishing action. Our Transport Canada licensed Captain and professional Toronto charter fishing boat crew is provided and is eager to bring you to the hot spots on Lake Ontario for the best fishing, boat cruise experience. Top of the line equipment and electronics are all on board to find the strike zone and maximize your Lake Ontario salmon fishing success. No experience is necessary! Toronto’s Izzi Salmon Sportfishing Charters is an official guide boat for the million dollar “Great Ontario Salmon Derby“. Flexible hours and downtown Toronto pick up available. Our season runs from April to October (weather dependent). 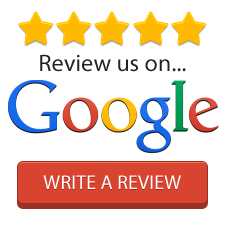 We also specialize in corporate groups, client appreciation and staff outings, as well as Toronto charter boat cruises for special events, such as the Toronto International Air Show, Festival of Fire (Fireworks) and Honda Indy. Catering is available at reasonable rates. 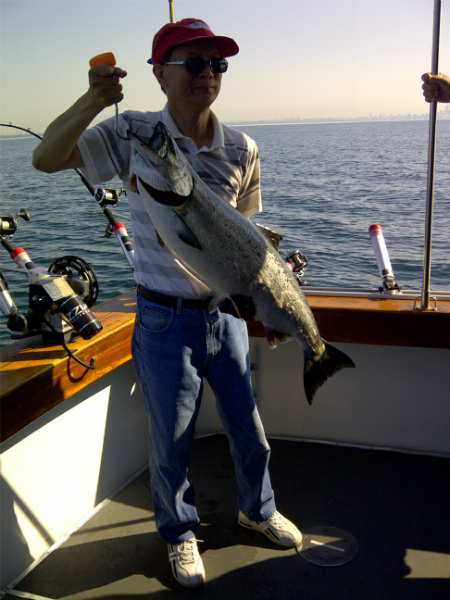 While fishing on Lake Ontario, you will be catching primarily salmon and trout. We use controlled depth techniques with downriggers to target specific water temperatures and sonar readings where the fish are. Depending on the time of year, you will fish from 1-15 miles off shore in depths of 20-350 feet! Our twin engine 46′ Trojan Sport Fish has over 900 HP to make sure you get to the hot spots safely. Our top of the line electronics and experience will help locate the “strike zone” on Lake Ontario and provide you with an unforgettable fishing experience!